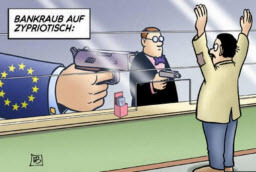 Banking in Cyprus … a different need for gun control? Cyprus? Many people rolled out of bed this morning and unless they’ve been on a Mediterranean Cruise, may have had to remind themselves about this island nation of 1,000,000 people not far off the coasts of Turkey and Israel. This is a must-view interview with Jeremy and Charlie Rose. It links with this weekend’s events in Cyprus. Keeping interest rates low is harmful — mostly to our senior citizens who need fixed-income alternatives that actually have a rate of return … and as Grantham points out, low interest rates are the engine for wealth transfer from the less wealthy to the most wealthy. Enter Cyprus. In a nutshell, imagine how you’d feel if you woke up to discover that FDIC insurance didn’t “hold up”, that you couldn’t withdraw your deposits … and that your total assets on deposit were about to be subjected to a special tax — with the amount based on the size of your account.